Aaron is the worship pastor at Grace Fellowship Church, in Snellville, GA; his heart is to restore the Word of God to the foundation of corporate worship, and to see a shift in the next generation of worship leaders to becoming more biblically empowered worship pastors. Six months out of the year, Aaron has younger worship pastors living in his home as part of an intensive worship discipleship course, involving daily teaching, mentoring, coaching, and community. Aaron's band travels internationally, leading worship and coaching worship leaders as the Lord gives opportunity, and Aaron works with Kingsway Music, from the United Kingdom. Aaron and his wife of almost 10 years, Megan, have four sons - Cooper, Judah, Nyle, and Linen. Linen is only 5 months old, so he's not pictured above. Between church life, traveling, song-writing, and parenting, Aaron and Megan are loving their lives and excited about their next season of life, love, and music. 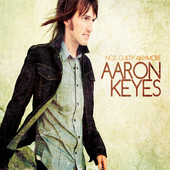 Aaron Keyes official website. Click here to download several hundred FREE charts for praise and worship songs that Aaron has carefully transcribed.